Slacker Radio 3.0 Goes Live In The USA! The time has finally come for all you music lovers in the USA to download the new Slacker 3.0 application. We first told you this was coming earlier this year at CES 2010, and then it launched first in Canada. Now all users in the USA can download the new version, and take full advantage of the benefits of 3.0 such as wireless station caching, new interface, and improved battery life. Before you get too excited, there is a catch with upgrading to 3.0 that some people may not be happy about -- caching, whether done via wired connection or wirelessly -- will now only be available on a Slacker Plus account, which are available for $4.99/mo, $14.97 for 3 months, or $47.88 for a full year. Don't get upset just yet, for those not wanting to upgrade to Slacker Plus, you can keep your Slacker 2.0 and still have wired caching for free. However, I completely think the upgrade to 3.0 and Slacker Plus is well worth the money. I have been using 3.0 since CES this year and love waking up to find my cached stations have refreshed overnight. Hit the jump for the full press release and some 3.0 screenshots, or head to slacker.com to download. SAN DIEGO, Feb. 23 /PRNewswire/ -- Slacker, Inc. today announced the availability of Slacker Radio 3.0 for BlackBerry® smartphones from Research In Motion. Music lovers can now cache their favorite Slacker stations wirelessly directly to their BlackBerry smartphones to enjoy personalized radio on-the-go regardless if they are still connected to a wireless network or not. Slacker Radio for BlackBerry 3.0 is available today by visiting Slacker.com from a BlackBerry® Browser and will soon be available on BlackBerry App WorldTM. 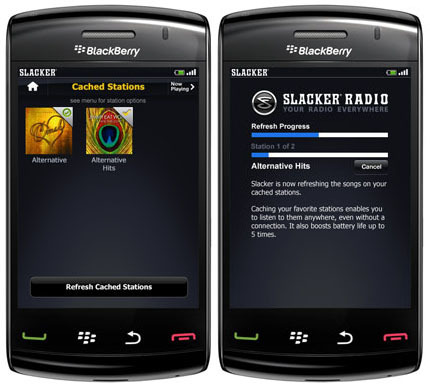 With Slacker Radio 3.0 and a Slacker Radio Plus subscription, music enthusiasts using a BlackBerry smartphone can wirelessly cache their favorite stations simply by selecting "Cache Station" from the menu within the application. Listeners can choose to manually cache their favorite stations or use "Auto Refresh," enabling BlackBerry smartphones to automatically wake during overnight charging and refresh station content, providing new music daily with no additional effort. Cached stations are stored on the memory card of the BlackBerry smartphone and can be played on subways, planes and all destinations in between with no network drop-outs and minimal battery usage. Along with station-storing capabilities, Slacker Radio Plus features ad-free listening, song lyrics, unlimited song skipping, unlimited song requests and more. Listeners of the free Slacker Basic Radio service will be able to play cached stations for up to 14 days, providing the opportunity to try the full benefits of station caching on their BlackBerry smartphone, risk-free. "BlackBerry smartphone users can now benefit from the convenience of wirelessly caching their favorite Slacker stations," said Jonathan Sasse, senior vice president of marketing at Slacker. "This addition makes it even easier to store music directly on their smartphones to get the most out of the Slacker Radio experience and truly listen to their music everywhere they go." The millions who listen to the free Slacker Basic Radio service will continue to enjoy an unparalleled music experience with new enhancements in the 3.0 version, including improved battery life, faster application startup and an updated interface. With access to a song library that is nearly four times the size of the leading competitor, BlackBerry smartphone owners can use Slacker Basic Radio or Slacker Radio Plus to create their own Personal Radio stations or listen to and personalize over 120 expert-programmed genre stations. Slacker Radio for BlackBerry 3.0 is available today by visiting Slacker.com from a BlackBerry® Browser and will be available soon on BlackBerry App WorldTM (http://www.blackberry.com/appworld). Slacker Radio Plus is available for as low as $3.99 per month and can be purchased from within the Slacker Radio application or by visiting http://www.Slacker.com/RadioPlus from a desktop web browser. Please visit www.Slacker.com for additional details. 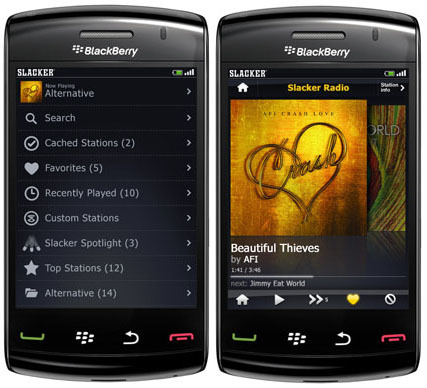 Slacker Radio 3.0 for BlackBerry is compatible with BlackBerry smartphones model 8500 and higher** including all BlackBerry Bold, BlackBerry Tour and BlackBerry Storm series and most newer BlackBerry Curve series smartphones. Slacker is the world's first Personal Radio company offering "Your Radio Everywhere." Slacker allows music lovers to play highly personalized music online at the Slacker web site or on the go with Slacker Personal Radio players and mobile phones. Slacker mobile applications are currently available for Android, BlackBerry smartphones, Palm web OS, and the iPhone. For more information visit http://www.Slacker.com/everywhere. For regular Slacker updates follow us at www.Twitter.com/SlackerRadio, become a Fan on Facebook at www.Facebook.com/SlackerRadio or visit www.Slacker.com. ** The BlackBerry 8830 smartphone is not currently supported with Slacker for BlackBerry 3.0. To download Slacker 3.0, head over to the Slacker.com website on your BlackBerry browser, or go get it from BlackBerry App World.